The Jewish Latin Center was created with the aim of building a sense of community for Latin Americans Jews living in New York. The center's work is based on the idea of spreading traditional Jewish values in the kind of warm and welcoming atmosphere that is familiar to Jews from Central and South America. And with an assortment of activities such as Shabbat services and dinners, Torah classes, cultural events, children programs and Bar/Bat Mitzvah classes, the center welcomes everyone with open arms, regardless of background or affiliation. This approach resulted in a community of almost a thousand members in the first couple of years of operation. The Jewish Latin Center's spiritual leader, Rabbi Mendy Weitman, or Rabbi Mendy as he is known, was born in São Paulo in Brazil, where his parents were based as Chabad emissaries. He pursued his rabbinical studies in Argentina, Israel, and France, finally graduating in the United States at the Rabbinical College of America in New Jersey. He has a vast experience with outreach programs in various countries, including Nepal, Ghana and Russia, as well as assorted projects in South America. His background, coupled with his natural Latin warmth, are especially useful in making people feel like they are still part of their own communities, even if thousand of miles away from their homes and families. The idea to create the Center initially came to Rabbi Mendy in the course of a series of Torah classes he had been conducting to small groups of Latin American Jews in professional offices across Manhattan. According to the Rabbi, "a common complaint was the lack of a local community where they felt welcome. And as I slowly built a small network of contacts, I felt that a shared priority between them was the desire to meet more people like themselves, with the same roots, as a way to make them feel less isolated. And that realization motivated me to create the Jewish Latin Center, with the purpose of filling this void in their lives." 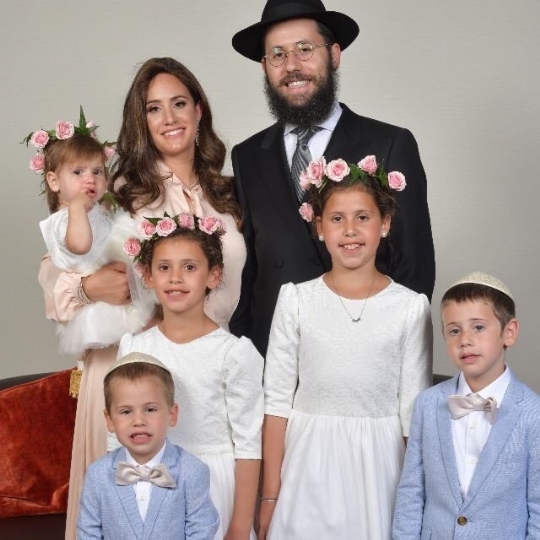 It was once Rabbi Mendy and his wife Frumie moved to Manhattan from Brooklyn in September of 2009 that the Center truly began to come to life. But it wasn't an easy beginning, as the Rabbi recounts "we started just ten days before Rosh Hashanah and it was very hard to get a Minyan for the prayers. That is in stark contrast to our monthly Latin Shabbat dinners, which a little over six months later were already attracting a capacity crowd of 120 people on average." It is important to note that the general consensus among participants is that the success of the Shabbat dinners is in great part due to its continuity. The monthly schedule affords members a steady environment where they can develop social and professional relationships, while reinforcing their links to the Jewish faith. And to maintain the continuity in between the more elaborate Shabbat dinners, the Center also offers a weekly Kabalat Shabbat followed by a Kiddush. The Center is also steadily organizing special events, such as a High Holidays prayer and dinner services, as well as annual Chanukah, Purim and Passovers celebrations. There is also a stream of debates on current affairs, workshops with experts on assorted topics, and finally, special ceremonies such as one in memory of victims of the Holocaust with the presence of survivors relating their personal stories. Other activities include weekly Torah classes, a weekly email sent to all its members with an inspirational Torah thought from the Parsha, and most importantly, an active central committee with members representing the main Latin American countries with the purpose of addressing the specific needs of members from the same country. This committee is an essential tool in the Center's philosophy of addressing each member individually, paying attention to the social difficulties they face when transitioning between different cultures and customs. What all this means is that Latin American Jews looking to meet more people like themselves - professionals, students, couples, families and kids - can count on the Jewish Latin Center as their New York home away from home.